A sense of urgency and fear of loss are powerful sales drivers in ecommerce. Undecided shoppers can be encouraged to make an impulse purchase if they think they’re in direct competition with other people for a product that has limited availability. I recently rounded up 11 examples from ecommerce sites that use stock levels to create buyer urgency, but that’s by no means the only tactic available. Here is a range of other techniques used by well known brands that can prove to be very effective in driving conversions. And just to clarify, I’ve intentionally avoided group discount and flash sale sites (e.g. Groupon) that are built around scarcity and deadlines. When you look at a hotel on Booking.com two messages briefly appear in the top right-hand corner. The most recent booking at this hotel. How many people are currently viewing the hotel. The aim is to let users know that this hotel is popular (someone made a booking only a few hours ago) so they’d better make a booking before those other seven people snap up the rooms. And Booking.com adds to the sense of urgency by notifying users of dwindling availability among the room options. It all contributes to an atmosphere of competition and urgency that people towards the checkout. Hotels.com uses similar methods. When you view a hotel on the site a message pops up saying how many people have viewed it in the past hour. This is followed by another message that says how many times it has been booked in the past 24 hours. Ebay has displayed the number of people watching an item for as long as I can remember, but recently it seems to have been adding more features aimed at creating a sense of urgency. The ‘watchers’ information refers to the number of eBay users tracking the item, so it’s a way of increasing competition for items. To add to this, eBay also briefly displays a graphic on the left of the screen which states how many people are viewing the item each hour. It creates a sense of urgency by instilling a fear of loss, as items on eBay are typically scarce so shoppers don’t want to lose out to other users. In the above screenshot you can also see the stock information, which reveals that four of these items have already been sold and only three are still available. It’s another way of showing people that this product is popular and quickly selling out. Finally, there are also more standard persuasive techniques, such as the offer of free postage and returns, and fast delivery. Of course, the most effective way of creating a sense of urgency is to set a short deadline and display a ticking clock. 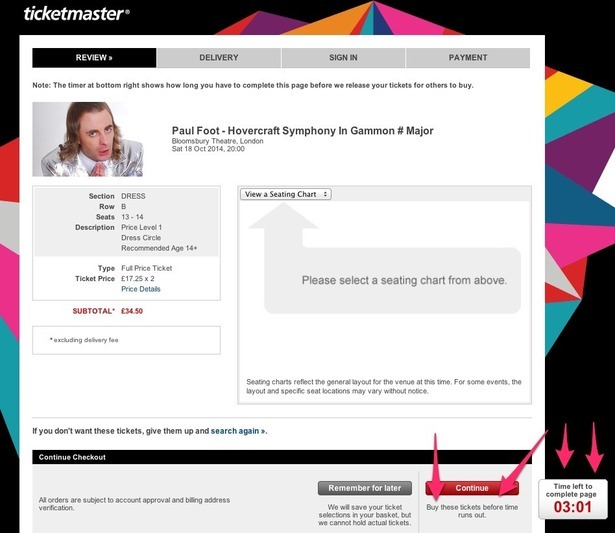 Ticketmaster gives you just three minutes to complete each page, so there’s no time to get distracted or head off and make a cup of tea. And if the ticking clock isn’t enough to focus the mind, there’s also some text that advises users to ‘buy these tickets before time runs out’. In fairness Ticketmaster does have a valid reason for using this method, as when tickets are in high demand you don’t want people adding them to their basket then spending several days deciding whether or not they really want them. And it’s a tactic that might not work in other areas of ecommerce because shoppers don’t generally want to be rushed and given only a few minutes to complete a purchase. Simply Hike employs a different version of the ticking clock. It uses a time limit on the product page rather than in the checkout, telling customers that they have only a few hours to secure next day delivery. This technique would only really work if the shopper is impatient or needs the products in a hurry, but it probably proves quite effective at securing a few extra sales. This excellent example comes from vintage marketplace Ruby Lane. 16 other shoppers have this item in their cart or wish list. Don’t miss out! It’s a slightly different take on eBay’s tactic of displaying the number of people watching an item, and is very effective at creating a sense of urgency. What makes WaterAid’s donation landing page so effective? Far too many charities overlook the importance of a conversion-friendly website when looking for donations or volunteers. If done right, a well-designed website has the potential to influence almost every visitor, regardless of their original intent. Essentially it will result in driving more users to important pages of a site and once there, converting them at a better rate. This is vital if paid media is being used to attract them originally, and while many fail here, I feel WaterAid is doing a brilliant job, so I thought I would share why to help inspire other charities. And for more on this topic, check out Econsultancy’s other posts on WaterAid’s excellent Instagram campaigns, plus five other examples of charities with great Twitter feeds.